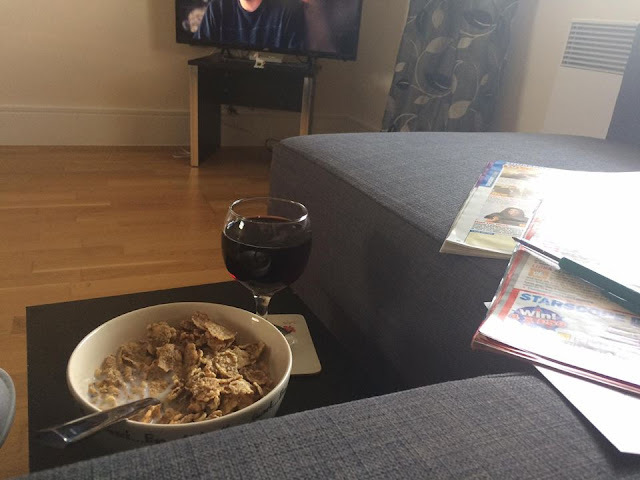 Anyone else spring clean their house before going away? I actually clean the house to spring clean standard every week, out of boredom. All the washing and ironing is done. I did a shop, wrote lists for Peter that he'll ignore then wake me up with a phone call at 4am forgetting the 3 hour time difference because he can't find the cat litter and he needs to go to work now, but it's what I do and I know when I come home, he'll have kept the house clean and tidy but I'll spend the first week, getting the house back into order, my order. It's been a stressful few weeks dealing with several family and health issues, a bit of a scare this week, which needed me to register with a UK Doctor the day I arrived, a bit of drama with one of the kids and a few other things going on that I still can't blog about, not all bad though, just waiting for 2 of the kids to get around to sharing their news before I can share it. 169. Sunday. Dad. 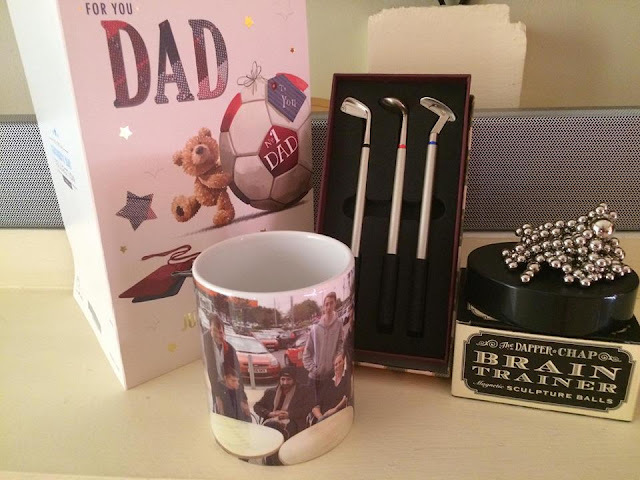 The teen bought a card and gifts when he was here over Whitsun but forgot to sign it, 2 boys sent a message on FB after a prompt and have sent cards but sadly they didn't arrive in time. I had my BOGOF blow dry, so decided to take up the 'free' one in the morning before flying to the UK as well as a manicure, pedicure and new shellac polish. I then had lunch with a friend, finished packing my case. I got to the airport at midnight, ready for my 2 flight to the UK via Istanbul. 170. Monday. Celebrate. It's the little things. 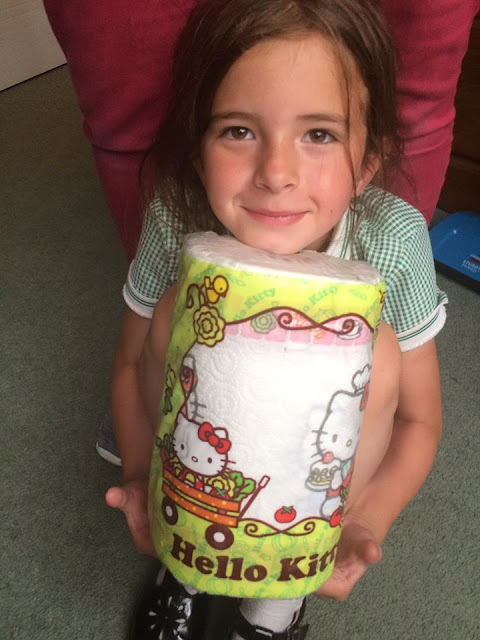 After her initial upset that Uncle Peter wasn't with me, my 6 year old niece was easily pleased with her Hello Kitty kitchen roll gift, last time it was Hello Kitty toilet paper, you wouldn't believe how much excitement loo roll can generate.....lol. Arrived on schedule at Birmingham. 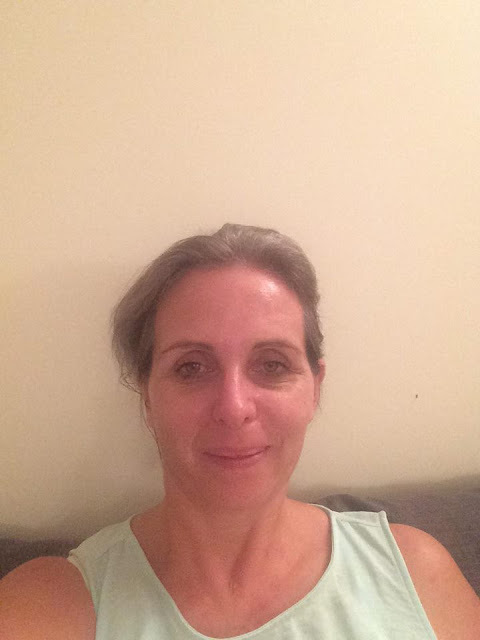 My sister collected me, the first time she's ever been able to do it due to her health, makes one hell of a difference not to have to catch a train/bus or pay for expensive car hire after such a long flight. Collected child 4 of 5's car to use for the summer as he's away with work until February, so it saves me quite a chunk of money this trip. 171. Tuesday. Colour. I brought the sun from Dubai with me, you can thank me later. It's been so nice being able to sit outside and enjoy it. A lovely lie in, in the flat, so nice to have been able to unpack and have my own space. 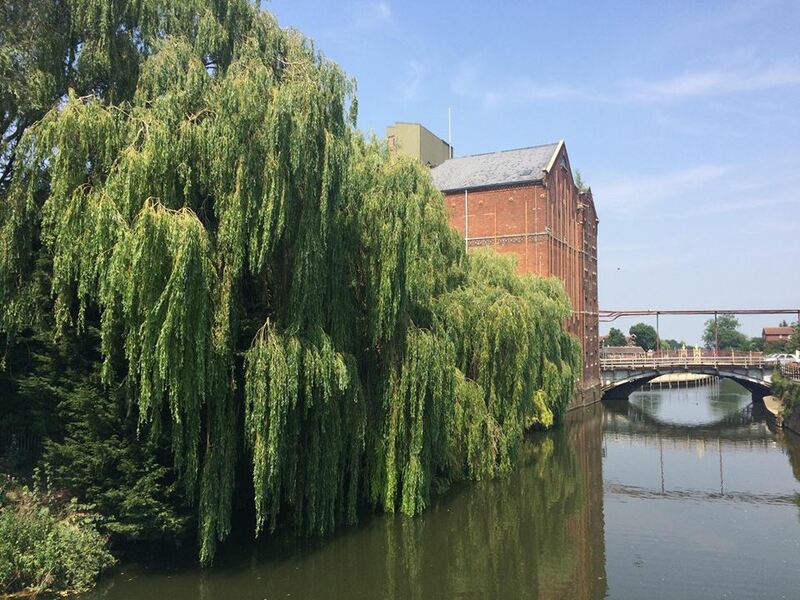 The afternoon was spent pottering around Tewkesbury and at the teens school, with his teachers trying to sort out his future once he leaves in 2 weeks time. I called in at my mums for a slice of her birthday cake, sadly it had all gone by the time I arrived. 172. Wednesday. The letter S.......The face of stress. I'm not sure how much more I can actually take. I didn't sleep well, just couldn't get off and woke at 6am. There are a few bits and bobs of paperwork to sort on this trip, but no time limit as I don't have a return flight booked, so I taking one day at a time while I can. 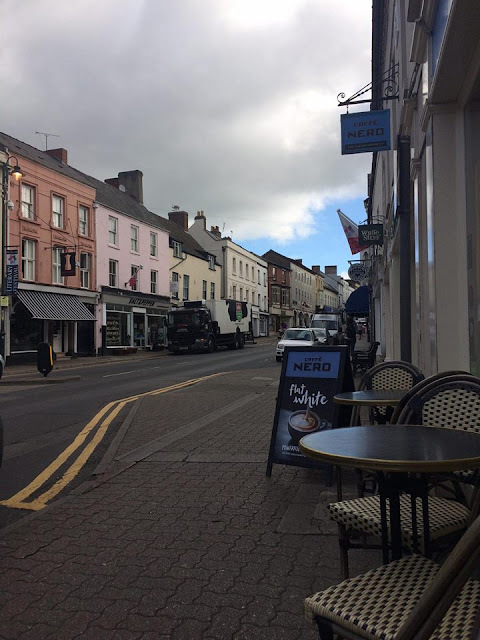 I met my sister in town for a coffee and spent the afternoon with my ex SIL and ex MIL before visiting child 2 and 2a for a fish and chip supper in their new home. 173. Thursday. Leaps. Feel like I'm constantly being forced to jump through hoops, but I'm not sure for whose entertainment. There's a theme going on here. Another restless night and up early. I'm not hungry at all, but I'm forcing myself to eat, but I'm drinking plenty. More Coffee with my sister and out for lunch to meet her boyfriend, we had a nice afternoon. I was in my PJs by 6pm, watching trashy tv and reading trashy tv mags, trying to switch my brain off. 174. Friday. Doors. Enough with this weather now. I will confess I have found it hot, but not Dubai hot, but now the temps have dropped back to normal UK summer, equivalent to winter in Dubai, I'm finding it cold, everyone has all the doors and windows open and I'm now shivering. Grrrrr still no sleep, been getting plenty of exercise, going for walks every day. Off to Hereford with my sister for a spot of retail therapy, called in to see my parents in the evening and attempted another early night. 175. Saturday. Cool. Early morning walk around town and coffee shop visit at 8am, so lovely to be able to sit outside. Did I mention that? Pool party at my sisters with my 6 year old niece, and my older niece and her 3 year old, 18 month old and 2 month old boys. My first meeting with the new great nephew, he was born the day I left the UK on my last trip. Hope things settle down soon. It sounds like you have a lot on and quite a bit to worry about. Nice to catch up with family. Hope this holiday sees you unwinding and relieving some of the stress which is probably not helping the sleep problems. Ahhhh so it is your fault it is so warm, please do not bring the sun back with you again. Aww had to smile at the Hello Kitty gift! Hope things settle down a bit and you have a good time while you are in the UK. Mother plays instrumental role in cleaning whole house. 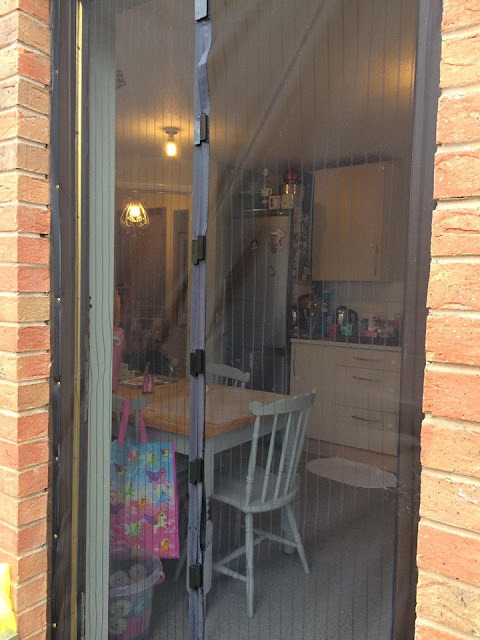 I always learnt to keep my house clean and neither panic for it.